It’s Christmas eve; we will soon be celebrating the nativity, but I am going to remind you of how it started: with the annunciation. In this triptych*, the archangel Gabriel appears before the virgin Mary to tell her of the forthcoming birth of a son. Notice anything unusual about the angel, and the rosette of angels in the apex of the gothic arch? 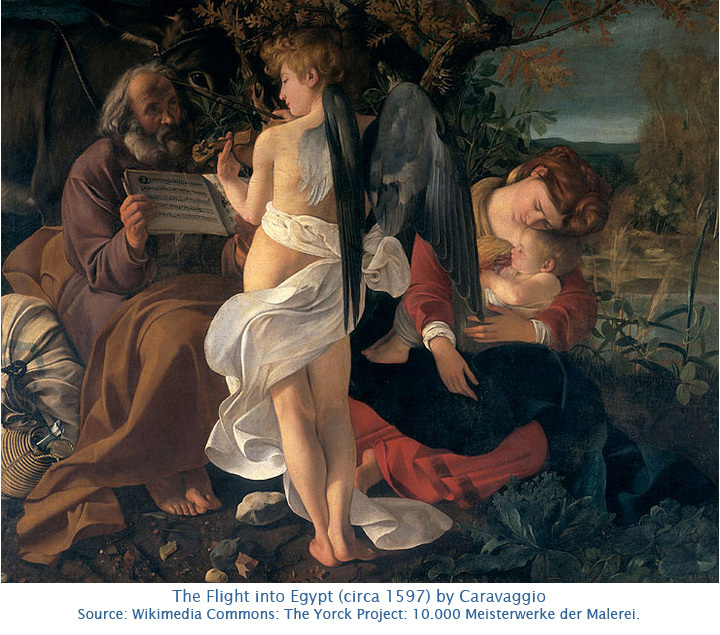 Here is another painting: The Flight into Egypt by Caravaggio, which shows an angel comforting Joseph and Mary by playing the violin as they flee the Slaughter of the Innocents. Notice it now? Answer: in both pictures the angels have dark wings. This seems at odds with the modern vision of an angel with white wings and white robes. The popular image of an angel as feminine, virtuous and compassionate, appears to have been a Victorian invention (or at least it was adopted as an archetype by Victorian artists and writers). This sentimental version was endorsed by the Edwardians and then by Hollywood so that most people tend to assume that angels have always looked like that. In fact, from the Byzantine empire up to the eighteenth century, many angels were depicted as either male or androgynous messengers from God, and could be fearsome if they were delivering a message of wrath. There are several iterations of angels in paintings of this period: a few are all-white, while others have no wings at all; many possess multi-coloured wings and robes; but the majority are depicted as having dark wings and wearing white or plain-coloured robes. Angels with dark wings came to prominence through the classical paintings of the Renaissance**, the cultural movement founded in Italy in the 14th Century. Renaissance art and architecture was highly influential during the Georgian period, being the style of choice of the British aristocracy. This was the age of the connoisseur: usually a man of noble birth, or at least from a wealthy family; educated in the classics; and who had undertaken the Grand Tour of Europe to complete his education. He would have seen those paintings during his time (usually months, sometimes years) in Italy. Imagine then, the appeal of a canary with wings like the angels that had so fascinated him during his Tour! That canary would have been the fine spangled sort, or London Fancy, which in its ideal form was entirely yellow apart from the black feathers in its wings and tail. An educated person would have understood the allegory; it would have given the owner a pretext to engage in polite*** conversation on religion, travel, and the arts. These things mattered; they implied refinement and good taste. A canary with classical features might seem fanciful to us, but in Georgian society it would have helped to convey the impression that its owner was a person of quality. We know that the best specimens were expensive and rare: attributes that would have made them all the more desirable to the elite who could afford them. It is unlikely that many connoisseurs actually bred London Fancies themselves, but we can be confident that there were breeders in the capital with the right connections eager to supply them. Those breeders were members of fancy canary societies; all of them located in London, many with prestigious addresses. They were exclusive clubs, the cost and conditions of membership designed to ensure that only the favoured few could join. A way of selecting like-minded individuals, or a way of preventing outsiders from entering the market? I can’t help thinking they were cartels in all but name. It couldn’t last, of course. The Grand Tour lost much of its prestige once steam ships made mass tourism to the continent feasible. Steam also powered the railway network, which brought other varieties of canary to the attention of Londoners. It is probably no coincidence that both the fortunes of the London Fancy, and our perception of angels, were transformed during the age of steam. * A triptych is a painting composed of three panels. 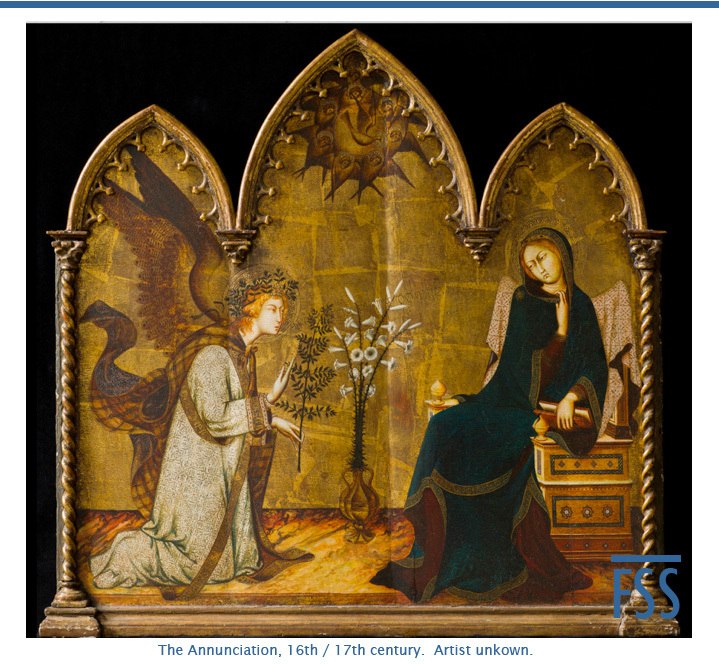 This painting is a later copy of the central panel from The Annunciation with St. Margaret and St. Ansanus by Simone Martini (1333). ** The Renaissance (meaning “rebirth”) produced a flowering of the arts based on the classical antiquities of ancient Rome and Greece. It is best known for the paintings and sculpture of Michelangelo and Leonardo da Vinci, and the architecture of Florence, Venice and Rome. *** ‘Polite’ meant ‘cultured’ rather than ‘well behaved’ during the Georgian period.